How to Keep Snakes Away from the Yard Most homes with yards have seen a snake or two, but if those reptiles decide to stay you need to know how to handle the situation. Most snakes are harmless and do a world of good for insect and rodent control; however, some snakes are deadly and there are very few ways to tell the differences between species. Proper lawn care is one of the most important tools of snake prevention and control. Grass that is too long will attract insects and then snakes. Decorative rocks and stone fences are also great snake habitats. By keeping your yard trimmed and low-growing vegetation to a minimum, snakes will not be drawn to your yard in the first place. To get rid of a problem snake, trapping and removal is the safest and most effective way to go about it. You should not approach a snake with the intent to kill it; this is how most venomous bites occur. Purchase a plastic box trap with glue inside. Any trapped snakes can be released into an area where they will not be problematic. There are two types of snakes in a home: those that intend to be inside and those that have accidentally found themselves inside. If a snake has wandered into your home and you need to get it out, there are no completely hands-free methods of immediate removal with the exception of hiring a professional. A non-venomous snake can be picked up and removed in a number of ways including shooing it into a bin or picking it up and placing it into a pillow case. If you are unsure of the type of snake you are dealing with, you should never attempt to handle the animal. Even using a glue trap can be ill-advised as the trap will need to be examined daily. If you enter the area where the snake is confined and it is not in the trap, it is still loose in the room with you. For a snake trapped in the home, professional help is the best route of removal. 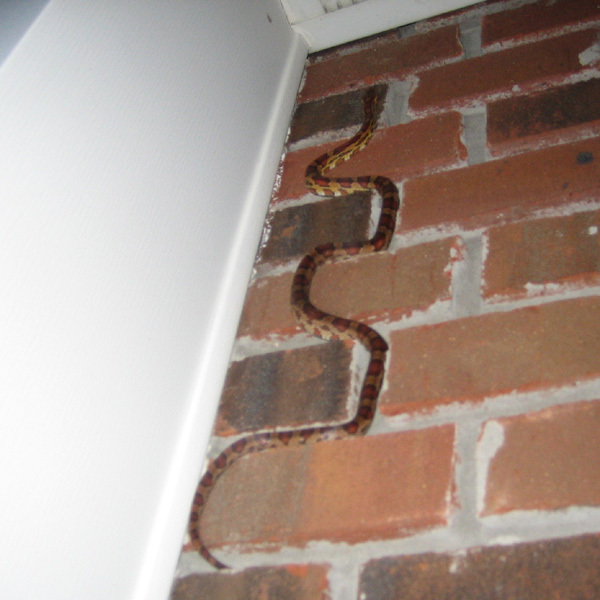 If you have snakes entering your home deliberately through an outside entry point, the removal methods above are the same; however, your home needs to be sealed immediately to prevent a future snake issue. Snakes love cracks in steps and under foundations. Fixing your snake problem may mean fixing a much more important, structural issue. Snakes in the basement usually enter through a crack in the foundation. Windows at ground level can be entry points if broken as well. A snake likes a basement because the space is cool and quiet, two attributes reptiles look for when they need to escape the heat of a summer day. The problem with a snake in the basement is that the animal will not be far from its den or from the hole where it gains access to the outside. Most snakes will immediately retreat when a human enters the basement, making capture impossible. Snakes that are deliberately inside of a home will not have the confused reactions of a snake that finds itself inside on accident. Trapping snakes in a basement is the most reliable means of removal aside from professional assistance. Glue traps with scent lures are very effective and allow venomous and non-venomous snakes to be removed and relocated. Place the traps near the area where the snake enters the basement. Once the animal has been caught, you must seal up and repair any cracks or more snakes will venture in. Go back to the main Snake Removal page for more information about snake prevention, and more information about how to keep snakes away.